Chloe couldn’t decide what she wanted to do for her birthday. To have a party or not have a party? She wasn’t particularly stressed about her indecisiveness, surprisingly enough. That’s because her birthday present this year is one for the ages (at least for Chloe). 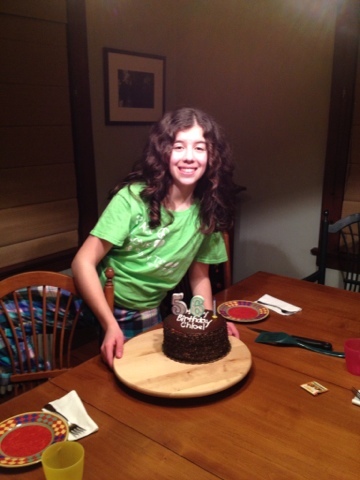 For her 12th birthday, I will be taking Chloe to see Lady Gaga in concert at Madison Square Garden. When I was her age I saw the Rolling Stones in concert. Times have definitely changed, although I suppose she probably feels just as much the cool cat seeing the “Monster Ball” tour as I felt when I experienced the “Tattoo You” tour in Madison Square Garden about 31 years ago. Talk about bragging rights. I am now not-so-eagerly looking forward to very little sleep. But that’s ok. Chloe is one happy camper. And if she’s happy, I’m happy too.